Directed by Garrett Bradley, three friends question their ability to dream amidst a crumbling economic climate against the backdrop of New York and New Orleans. After a series of rejections, they resolve to reinvent themselves in hopes of successfully starting anew. Some World Cinema titles may contain mature themes or content. Viewer discretion is advised. Fanie Fourie's Lobola 97 min. Directed by Akan Satayev, this historical epic is a universal story about the freedom of the human spirit and the struggle against slavery and despotism, about love, loss and betrayal. 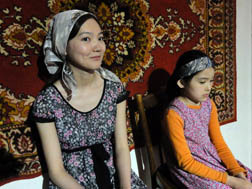 It is seen through the eyes of simple Kazakh kids and teenagers. This film was Kazakhstan's official entry to the 85th Academy Awards for Best Foreign Language Film. About 111 Girls 79 min. The Fantastic World of Juan Orol 95 min. Shyamal Uncle Turns Off the Lights 65 min.